Friday 31 August 2018 will be a date recorded as one of the greatest days in the history of Seamab Fives winners, FES Support Services. Perhaps not, but they did convincingly defend the crown they won in our inaugural tournament last year. The sun was shining as The Thomson Gray Seamab Fives – The Blue Dragons Tournament kicked off at Powerleague Sighthill in Edinburgh. 19 teams entered the tournament, some with an eye on the prize, others, let’s just say had an eye on future opportunities, in a tournament full of construction-related companies. Manchester-based property services consultancy Rapleys, who are experiencing great growth in their new Edinburgh office, certainly fell into the latter category. The team were in high spirits, however, when they received their wooden spoons. Bragging rights could be claimed by Will Rudd Davidson’s Glasgow office as they progressed through their group, with their Edinburgh office failing to do so. After a tough group stage, the tournament advanced to a straight knockout. There was a shock early on as last year’s finalists Clark Contracts lost the last 16 battle of the contractors against Robertson Central East. The contractors generally would have been high in the pre-tournament betting and the team from Bam Construction Scotland showed some early promise topping their group, but by the Semi-Finals, only FES were still standing. Another group winning team, quietly going about their business, were the Thomson Gray Allstars. They came up against the dark horse combination team of Michael Laird Architects and Harrison Stevens Landscape Architecture who showed how a design team can come together to rise from finishing fourth in their group to reach the semi-finals, where the TG team prevailed. In the other semi-final, tournament debutants Dougall Baillie Associates had conquered Oberlanders Architects and Robertson before facing FES. The final started with the words: “It’s bad form to win your own tournament”, ringing in the Thomson Gray team’s ears. The TG Allstars were subsequently steamrollered by a dominant FES, who became Seamab Fives winners with a final 4-0 score. 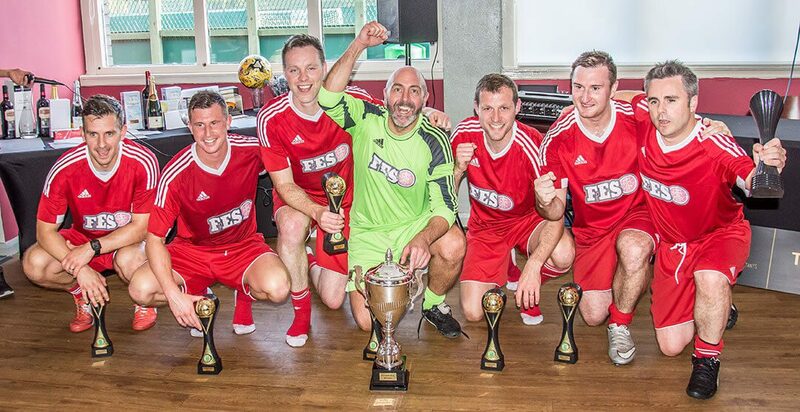 The Thomson Gray team must now wipe themselves down and go again, as they face the finals of Business Fives in a few weeks time.